If you’re tackling the trail with the throttle wide open, you’re bound to take a few spills—sorry, it’s just a fact of life. This, however, doesn’t mean that your clothes need to be made out of stuffy, military-grade canvas. Not satisfied with most of the offerings out there for gravity riders, we sought to find the happy medium with our Demo Pro Long Sleeve Jersey. It’s made from our venerable VaporRize™ fabrics, only we used a knit construction for this jersey, due to its strength and durability. This way, you won’t find yourself back here searching for a new jersey every time you take a tumble over the weekend. But just as importantly, this fabric selection combines the aforementioned strength with breathability and moisture management, so you won’t feel clammy and hot while you’re riding. We also included a zippered side pocket to carry your small items, like a phone or, say, your lift pass. 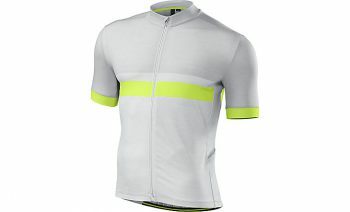 And as you were probably wondering, this jersey features our High Volume Mountain Bike Fit, so it’s purposefully designed to be loose, airy, and to have plenty of room for pads and body armor. VaporRize™ knit construction provides a lightweight, breathable, and moisture-wicking layer that’s still durable enough to withstand crashes. 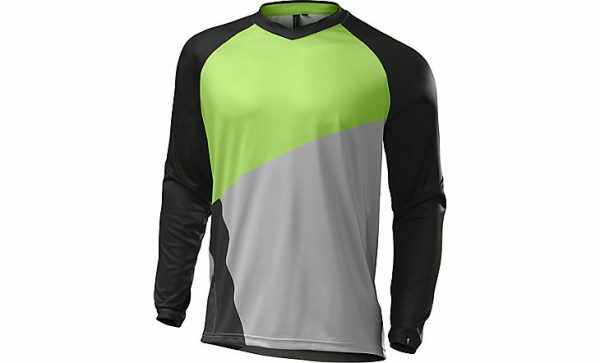 Long sleeves feature a loose construction to perfectly interface with armor and pads, while also keeping your skin covered for the inevitable bail. High Volume Mountain Bike Fit provides a loose fit that accommodates armor and pads, while also allowing for a full freedom of movement.